All Facebook accounts in my name are fake – Hon.Dabiri-Erewa warns Nigerians – Royal Times of Nigeria. Hon. 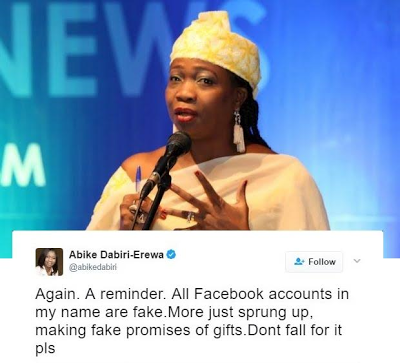 Abike Dabiri-Erewa, Senior Special Assistant to the President on Foreign Affairs and Diaspora has called on the attention of Nigerians that all Facebook accounts in her name are fake and advised that they should be vigilant not to be tricked by imposters offering fake promises of gifts.